Canadian Wildlife Federation: A skunk sprayed my dog in my own backyard. How can I keep skunks away from my yard? A skunk sprayed my dog in my own backyard. How can I keep skunks away from my yard? A. If you have an animal hanging around your property, it’s probably because it’s found a food source or a shelter, or maybe both! Wondering what to do if your dog has been sprayed? A skunk’s main way of protecting itself is with its spray. And once it completely uses all of its scent, it takes about 10 days to replenish it – a vulnerable state if you’re a skunk! Skunks send signals before spraying. They thump their front paws, raise their tail and bend their head and back end towards you in a ‘U’ shape. 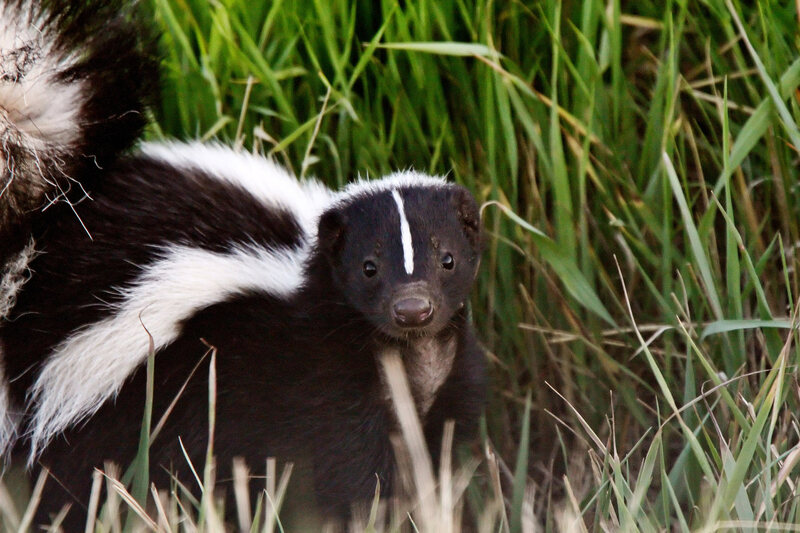 If the threat is still there, watch out – the skunk will protect itself. Before letting your dog out at night, give some warning in case there is a skunk in your backyard. Turn on an outside light and make some noise. Skunks don’t move all that fast. Wait a few minutes and then let your dog out. Spray this mixture on your dog and rinse it off after five minutes. Remember, this contains peroxide so be careful where you spray it and your dog may get a few highlights in the process! If a skunk is denning under a shed or a deck, you’ll want to do a few things to persuade it to leave. Make the den less desirable. Place some dog fur in and around the hole. If you don’t have a dog, a grooming studio may set some aside for you! You can place the dog hair inside a nylon stocking or an onion bag. This will keep the dog fur from blowing around and keep it concentrated in one area. Have some stinky gym clothes? Skunks view people as a threat. Placing some well-worn clothes around the den may be enough to make the skunk uncomfortable! Make the den harder to access. Partially fill the hole with some small rocks. The skunk may find it ‘annoying’ that every time it tries to come and go out of its den it needs to dig a bit. Before you close off the opening, make sure the skunk has left. You can find out if it’s left by placing some balled up newspaper to stuff in the entrance hole. If the newspaper hasn’t been disturbed for three nights in a row, that’s a good sign the skunk has left. If you don’t see any other evidence of the skunk, it may be time to animal proof the area! But before you do this, you need to know that there are two times of the year that need to be taken into consideration before you do any proofing. Between early October and mid to late March, you really can't rely on your balled up newspaper test. If the newspaper hasn’t been moved over three nights, it could be because the skunk has hunkered down for the winter. Skunks don’t hibernate but they do become relatively inactive. You don’t want to trap a skunk under there! Between April and the end of August, they might be in there with young! Young are typically born between April and the end of June and it takes about another eight weeks before they start coming out with the female. Because it could be a female with young; be cautious about separating them. When the young are around seven to eight weeks old, the female will begin taking them outside. When this happens, start making their den site less desirable using some of the suggestions above. Next up, go ahead and animal proof the area. Once you are sure that the skunk is no longer living there, it’s time to build a small trench. On all sides of the structure that the skunk can dig under, dig down one foot and then dig out towards you one foot, so it looks like a backwards L. Attach 1 inch x 1 inch welded wire mesh to the bottom of the structure, line the vertical part of your trench and then bend the mesh at a 90° angle to line the horizontal part of your trench. Above all, don’t try to relocate the skunk. First of all, who wants to move a trap with a scared skunk in it? It won’t solve your problem. I can guarantee that there is more than one skunk in your neighbourhood. Removing a skunk won’t remove the food or shelter that attracted it in the first place. Removing one skunk will only open that spot up for another skunk to move in. Moreover, there are laws governing the trapping and relocation of wild animals. Make sure to check with your municipal by-laws and your provincial wildlife department. For instance, in Ontario, you must release captured wildlife within one kilometre of where they were captured. While many people think that relocating an animal is the best option – it typically isn’t! Relocated animals can spread new diseases and they have to find new food and water sources in already occupied territory.